Greg is the Service Manager and is based at the Woodsford Depot. With nearly 35 years of experience in the farming industry give Greg a call if you need any work or repairs done. 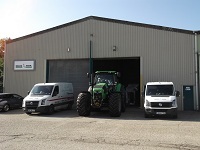 We carry out servicing and repairs to all makes of Tractors and Agricultural equipment. Trailer brake testing and Data-Tagging are also now available. Andy is in charge of the parts department and stores based at the Woodsford Depot. We stock a large range of Deutz Fahr parts and merchandise as well as batteries, paints, tools and nuts and bolts. If we dont have it in stock we can usually get it very quickly indeed. Give Andy a ring on 01305 853900.